Be the first to share your favorite memory, photo or story of Lowman. This memorial page is dedicated for family, friends and future generations to celebrate the life of their loved one. 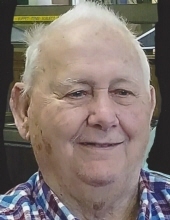 Lowman Claffy “L.C.” Collins passed away peacefully on Friday February 1, 2019. L.C. was born on July 7, 1929 in Dorchester County and was a son of the late Claffy Wesley and Julia Wimberly Collins.He was raised by his step mother,the late Marie Wimberly Collins He was first married to the late Gladys W. Collins, mother of his children and later to the late Adell W. Collins. He was a retired employee of The Savannah River Plant in the Patrol and later the Fire Department. He was a member of Calvary Baptist Church, Past Patron of Harmony Hope Chapter of the Order of the Eastern Star. He served as patron for 25 years. He was a Past Master of Harmony Masonic Lodge #17, Omar Shrine Temple and El Bab Shrine Club. Funeral services will be held on Sunday February 3, 2019 at 3 pm in the Calvary Baptist Church with Eastern Star Rites. Burial will follow in the Barnwell Co. Memory Gardens with Masonic Rites. Visitation will be held at Mole Funeral Home on Saturday from 5-7pm. Survivors include his children, Polly C. Sanders of Barnwell; W.C. (Emily) Collins of Barnwell and Benny (Melanie) Collins of Williston; Brothers David (Henrietta) Collins of Hanahan, Harry (Linda) Collins of Branchville, Phil (Susan) Collins of Aiken; sister, Vianna (Jerry) Snelgrove of Roseville; grandchildren, Robby (Teresa) Sanders, Donny (Christy)Sanders, Julia (Robbie) Ferguson, Chad Collins, Amy (Guy)Caskey, Shellie Baker, Honey (Wes)Wilson, Hana (Ryan) Love and Tanner Collins, one special step grandson, Collin Etheridge; two step daughters, Kathy (Ricky) Gleaton of Reevesville and Nancy Jo Williams of Orangeburg, a number of Great Grandchildren and Step Grandchildren and Step Great Grandchildren. He was predeceased by his daughter, Peggy Collins, his son Lowman Daniel Collins and siblings, Vidamae Dantzler, Dolly Metts and Wallace Collins. Memorials may be made to the Shriner’s Hospital of Greenville % Omar Shrine Temple, 176 Patriot Point Rd, Mt. Pleasant SC. 29464. Please specify for Greenville Shriners Hospital. To send flowers or a remembrance gift to the family of Lowman Claffy Collins, please visit our Tribute Store. "Email Address" would like to share the life celebration of Lowman Claffy Collins. Click on the "link" to go to share a favorite memory or leave a condolence message for the family.